Beauty and the Beast was one of my favorite Disney movies growing up. The love story goes beyond girl meets boy, girl falls in love with boy. Belle is the first human, not counting the enchanted objects, to look past Beast’s exterior. Her attention and kindness encourages him to become more human, making his inner transformation just as important as his outer change. They develop a friendship first and then fall in love. I am ashamed to say that despite being initially excited, I allowed myself to be swayed by critics giving their opinion based on the trailers. Once the movie was released and I heard great feedback from lifelong fans, I started to relax and get excited again. I finally saw the movie last Wednesday. When the title card filled the movie screen, I got chills and teared up. In that moment I realized how emotional the experience was going to be for my inner child. The sets are stunning. The village is like the picturesque interior of a snowglobe isolated from the rest of the world. There are golden, ornamental baroque details all over Beast’s castle, specifically French Rococo. Under the curse, the exterior is dark and dramatic; the word gothic comes to mind. As the centerpiece of the story, the enchanted rose is as striking as it needs to be. The theme is appropriately weaved into other parts of the film; Maurice attempts to pick a white rose from Beast’s garden, and Belle’s baby rattle is a red rose. Don’t even get me started on the final scene. The flower-draped ceiling is GORGEOUS!! The entire ballroom looks like springtime, airy & bright. Belle is the same beloved character but with a few modifications. Her day-to-day outfits are a quirky mix of materials and patterns, and combat boots are her footwear of choice. The wardrobe update matches her new role as an inventor just like her father Maurice. The yellow ballgown is a simpler design than it’s 1991 counterpart, but when you see how it moves onscreen, doubts will fly out of your mind. The gold touches make it shine, and the skirt floats through the air as if it were weightless. The look wouldn’t be complete without the gold ear-cuff, a subtle nod to Belle’s unconventional style. There is no need to say much about the celebration dress. The way it looks and moves in the ballroom during the final scene will take your breath away. Belle’s hairstyles are simple but very beautiful. My personal favorite is her updo in the library scene accessorized with a blue headband. Of course I have to mention Beast’s wardrobe which goes through a transformation of its own; it becomes more refined and princely as the movie goes on. Costume designer Jacqueline Durran deserves a lot of credit because she came up with outfits for a character who is animated during most of the film. A lot of work went into making sure the animated garments had the depth and detail of tangible clothing. The animators did a phenomenal job. Alan Menken is a musical genius so it’s a no-brainer that I like all of the new songs, especially Evermore. In terms of flow, Days in the Sun is a nice song, but it feels unnecessary. There is no nice way to say this so I’ll just rip off the band-aid. Many of the vocals are heavily edited, and I suspect it has more to do with lack of vocal ability than over-zealous audio editors. It is a fact that Dan Stevens hired a vocal coach to learn how to sing for this movie, and Emma Watson has never sung professionally. I am thrilled with their acting performances, but the vocals leave a lot to be desired; they sound robotic and lack emotion. I found myself holding my breath every time they sang because I desperately wanted it to sound good but knew it probably wouldn’t. A few times I was pleasantly surprised. Emma did a good job with Belle (Reprise), and Beast sounded much better in the second verse of Evermore. I saw a comment on YouTube regarding Emma’s vocals that was well put. I can’t remember the exact words, but this is the basic idea: The original songs, written for an experienced singer, are above Emma’s capabilities. She sounded better singing the songs written for her portrayal of Belle. I had the same problem with Ewan McGregor and Emma Thompson. Ewan has sung before in a film, and for the most part his vocals sound good. I know Emma can sing, and I think she was a great choice for Mrs. Potts. The issue is inconsistency. Sometimes the vocals sound good, and other times they sound heavily autotuned. Since both roles requires a certain voice, it is possible that manipulation was required to help Ewan and Emma stay in character while singing. The song Beauty and the Beast is a turning point in the story, and Mrs. Potts’ singing voice ruina a bit of the magic in what is an otherwise beautiful scene. Listening to it again, the vocals sound better than I remembered, but there are still some parts that don’t sound as nice as they should. Knowing that Emma has a great voice makes this even more of a heartbreaking disappointment. I love the cast, but this movie is a musical. Acting and vocals should be split 50/50 when considering the potential actors. Perfection was well within reach for this film, and lack of vocal ability was the one and only roadblock. Consider the rave reviews that Josh Gad and Luke Evans are receiving. Why do you think that is? Not only are their acting performances spot-on, but their vocals are spectacular. That is why they are the most successful part of this musical film. I want to end my rant by mentioning that I find the entire soundtrack to be over-edited, even the experienced voices such as Kevin Kline. I would have preferred less effects and rough edges. At least the final result would have sounded more genuine. Animation was the perfect medium for this story because it is a fairy tale that is not at all grounded in reality. When considering a live action version, you have to ask yourself if the story will translate. I commend the crew because I was a believer every step of the way. I like the realistic design of each enchanted object. They fit the style of the movie and still feel like the same beloved characters. I love the way the friendship develops between Beast and Belle. There are so many amazing scenes I could mention such as the library and Belle’s childhood home in Paris, but I will stick with one. Up until the ballroom scene, I was fully invested in the budding friendship. During the waltz when Beast lifts Belle, I felt a strong wave of emotion and instantly knew the relationship had become a love story. I was worried about the transformation because I wanted to be in the moment; I didn’t want to only see Dan Stevens in a wig. I am so relieved that the scene came together because it cemented the couple’s chemistry. I know that Belle’s final quote is controversial, but I LOVED it. I found the playful moment to be cute and relatable. 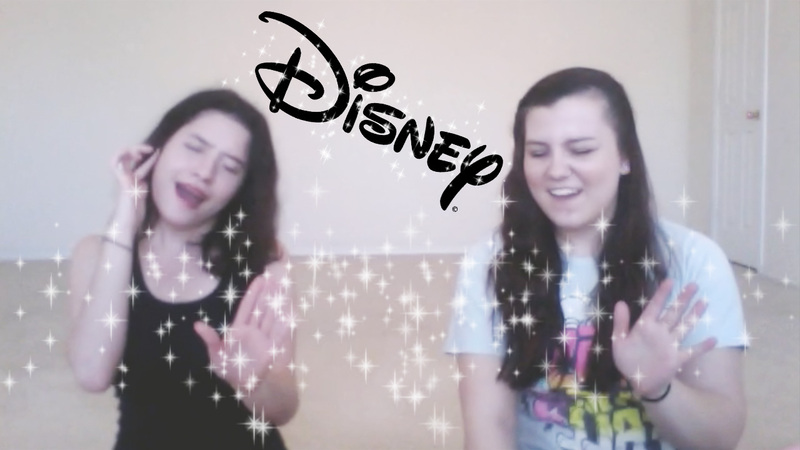 Me and my best friend Gabby did the Disney challenge featuring songs from “Frozen”, “Jungle Book”, “Lilo & Stitch”, “Lion King”, “Little Mermaid”, “Mulan”, “Pocahontas”, “Princess and the Frog”, “Shrek 2”, “Tangled”, and “Tarzan.” Warning! The following video features A LOT of dramatic lip synching and laughter. 1. At least two players are required plus someone to play the songs and keep score. We did not have a third person so I used the Pandora app on my phone. I put a towel over the top half of my phone where the songs were displayed and did the manual work myself (playing, pausing, etc). Gabby kept score on her phone. 2. Each person has ten seconds to guess the title of a song (One Point) and what Disney movie it comes from (One Point). After time is up, the other person can take a guess and try to steal the points. Each round can earn a player 0, 1, or 2 points. 3. The person with the most points at the end of the game wins. Me and Gabby ended the game after ten songs. I hope you enjoyed the video! Film your own version. It’s a lot of fun! !